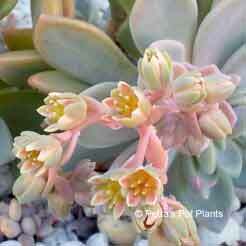 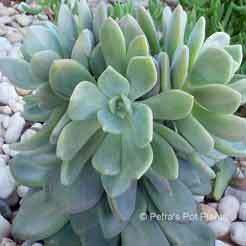 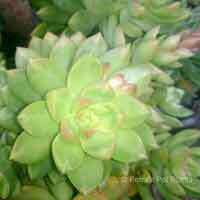 A hybrid between Echeveria and Sedum, the grey-green rosettes grows on a trailing stem that winds along the ground or spills over pots, taking root on contact with soil. 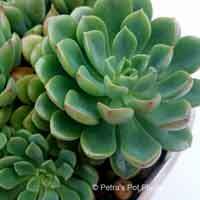 This plant will propagate itself by dropping leaves, which then sprout new rosettes. 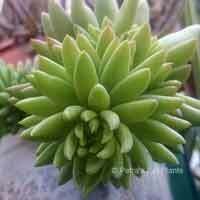 Perfect for starting a garden, beautiful potted display, or for individual pottings as gifts. 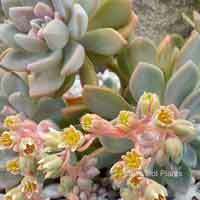 They do best in warm dry climates, in porous, well-drained soil. They love full sun to a little shade. 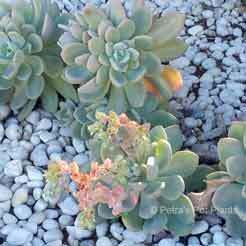 Provide shade in areas of extreme heat during the hot afternoon. 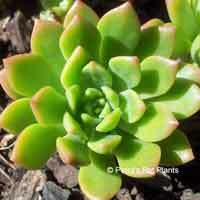 Height: Grows to about 20cm tall, 10cm diameter. 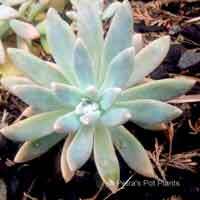 Light: Full sun to pertial shade.